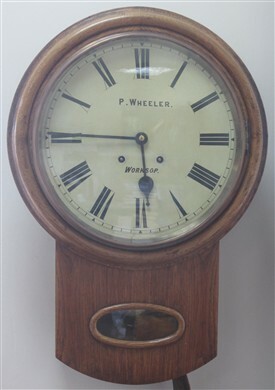 Philip Wheeler, clockmaker of 56 Bridge Street, Worksop, is one of 14 clockmakers identified as having operated in that town. (by Harold H Mather's book Clock and Watch Makers of Nottinghamshire (1979). Mather dives a date of 1864 for when Wheeler was known to be active, but if anyone knows of any other clocks by this maker (or has pictures of them), I would be very interested to hear about them. This page was added by Website Administrator on 08/07/2016. Here's some Census information I've found about P. Wheeler (Philip Wheeler) which shows that he was born in 1834 (in Colsterworth, Lincs, son of Thomas Wheeler an Excise Officer) and died at Worksop in 1892. The first Census where he is listed as in business as a clock-maker on his own account is 1861 - so clocks by him probably date from the late 1850s/early 1860s to 1892. 1851 Census: Philip Wheeler listed as an apprentice with Thomas Barlow, a watchmaker and jeweller on Bridge St, Worksop. 1861 Census: Philip Wheeler (aged 26) in business on his own account as a watch-maker and jeweller at 56 Bridge Street, Worksop, employing 2 apprentices. He is married to Hannah aged 23. They have one son (aso Philip) who died in 1867. (They subsequently had other children, including Arthur who took over the business after Philip snrs death in 1892). 1891 Census: Philip still listed at Bridge Street, with son Arthur now being identified as 'Watchmakers Assistant'. 1892: Philip Wheeler died in Worksop in the July/Aug/Sept quarter. Do you have a copy of this Worksop publication?